A Fresh Approach in Afghanistan: An End to War? Left out of the options under consideration in “Obama’s war” is the only one with any chance of success. Despite assurances to the contrary in Washington and a major policy speech in London , one need not quibble with the obvious fact that the situation is deteriorating beyond repair in Afghanistan . Although international media is more concerned with what that means politically for United States President Barack Obama and British Prime Minister Gordon Brown, little attention is given to the browbeaten and war-weary people of that country. Dan Senor and Peter Wehner responded with a peculiar diatribe in the New York Times, accusing Will of allowing his party allegiance to influence his views on the war. The two authors, senior fellows at major US think tanks, offered a bloody rationale wrapped in deceptive wording. They argued that historically Democrats opposed Republican wars and Republicans have done the same, and that must change. It was implied that pretty much every major war in recent decades was a war that served US national security interests; therefore, “Republicans should resist the reflex that all opposition parties have, which is to oppose the stands of a president of the other party because he is a member of the other party.” In other words, yes to war, whether by Democrats or Republicans. The intellectual wrangling, of course, is not happening in a vacuum; it almost never does. Indeed, there is much politicking going on; intense deliberation in Washington , political debates in London ; defensive French statements, and more. It seems that the war in Afghanistan is reaching a decisive point, militarily in Afghanistan itself, and politically in major Western capitals. But why the sudden hoopla over Afghanistan ? For after all, the bloody war has been grinding on for eight long years. The Taliban and various groups opposing the Kabul government and their Western benefactors are gaining ground, not just in the southern and eastern parts of Afghanistan . Daring Taliban attacks are now taking place in the north as well, long seen as peaceful, thus requiring little attention. On 26 August a roadside bomb hit the car of the chief of the provincial Justice Department in the northern Kunduz province, killing him, and sending shock waves through Kabul . The bloody message was meant to echo as a political one: no one is safe, nowhere is safe. Another attack was reported in the province of Laghman , in the east, where 22 people, mostly civilians were killed. Among the dead were four Afghan officials including the deputy chief of the National Directorate of Security, Abdullah Laghmani. The irony is too obvious to state. In Washington , London and Paris politicians wish us to believe that they are not unnerved by all of this. They exaggerated the significance of the recent Afghani elections, attempting to once again underscore that the “crucial” elections placed Afghanistan on a crossroads. Crossroads? What does that even mean, in any practical terms? George Will, although selective in his logic, was honest enough to mention that President Hamid Karzai’s “vice-presidential running mate is a drug trafficker.” Even US officials admit that the government they’ve created following the war is corrupt, to say the least. Richard Holbrooke, among other foreign envoys “responsible for Afghanistan “, told reporters in Paris on 2 September that US officials have no preference among the candidates, nor are they particularly interested in runoff elections, but they wished to see a government that appoints “more efficient, less corrupt ministers”. It behooves those “responsible for Afghanistan ” to remember that inefficiency and corruption were the outcome of the very policies they have so eagerly adopted in the country. No sympathy for Karzai here, but it’s unfair to point the finger at a feeble leader whenever a Western strategy fumbles, as it has repeatedly. Speaking of strategies, what is the plan ahead? French Foreign Minister Bernard Kouchner promised that foreign troops will stay put in Afghanistan unless the country’s security was ensured, reported Xinhua. In practical terms, this means never, for how could security ever visit that region as long as the strategy is hostage to two equally destructive narratives — the Senor/Wehner troop surges vs Will’s “offshore” strategy? Hubris aside, Washington and London are facing some difficult political and military decisions ahead. Top officials in both capitals are using grim and somber language. US Defense Secretary Robert Gates, responding to a call by the top US general in Afghanistan for a fresh approach to the conflict, is considering yet another troop increase as part of Obama’s new Afghan strategy. The sense of urgency was invited by the detailed report of the newly appointed General Stanley McChrystal, who maintains that “success” was still possible, but a change of strategy is needed. The report resulted in intense deliberation in Washington , highlighted by grim press conferences involving the Pentagon’s heavyweights, including Admiral Mike Mullen, chairman of the Joint Chiefs of Staff, over what to do about “Obama’s war”. 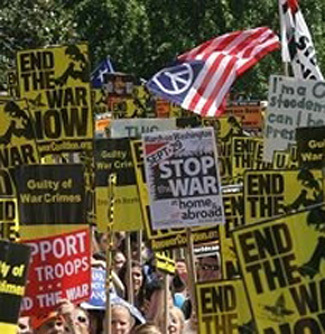 The details of the new Obama strategy are still not very clear, but the commitment to the war is still unquestionable, as expressed in a “major” 4 September speech by Prime Minister Gordon Brown. “When the security of our country is at stake we cannot walk away,” said Brown, according to the BBC. As Brown was solemnly speaking about British security, NATO air strikes on a pair of fuel tankers killed up to 90 people, according to Afghan authorities. Indeed, the situation in Afghanistan requires a fresh approach, although not the one George Will had in mind. Ramzy Baroud (www.ramzybaroud.net) is an author of several books and editor of PalestineChronicle.com. His work has been published in many newspapers, journals and anthologies around the world. His latest book is, “The Second Palestinian Intifada: A Chronicle of a People’s Struggle” (Pluto Press, London ), and his forthcoming book is, “My Father Was a Freedom Fighter: Gaza ’s Untold Story” (Pluto Press, London ), which is now available for pre-orders at Amazon.